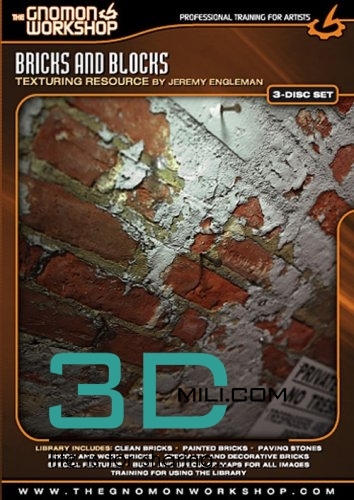 Bricks and Blocks (2 DVDs of textures and 1 DVD of training) contains 250 high resolution textures for the creation of all kinds of brick and cement block surfaces. Included are photographs of clean bricks, bricks which have been painted, bricks used as paving stones, rough and worn bricks, as well as specialty and decorative bricks. Gnomon Workshop textures are high resolution and seamlessly tileable. This allows for the creation of texture pages of any size – from the walls of an entire factory complex down to the exposed brick surrounding a mouse hole. Every texture has a corresponding bump and specular map. These have been hand manipulated to ensure a proper bump and specular response, and are not simply a grayscale version of the color map. The textures are entirely handled and stored in 24-bit TIFF format to avoid any compression artifacts normally associated with JPEG images. Also supplied are more than 200 features – texture maps with alpha masks that add richness and variety to any texture project. Included are features commonly found with bricks like graffiti, paint, windows and more.